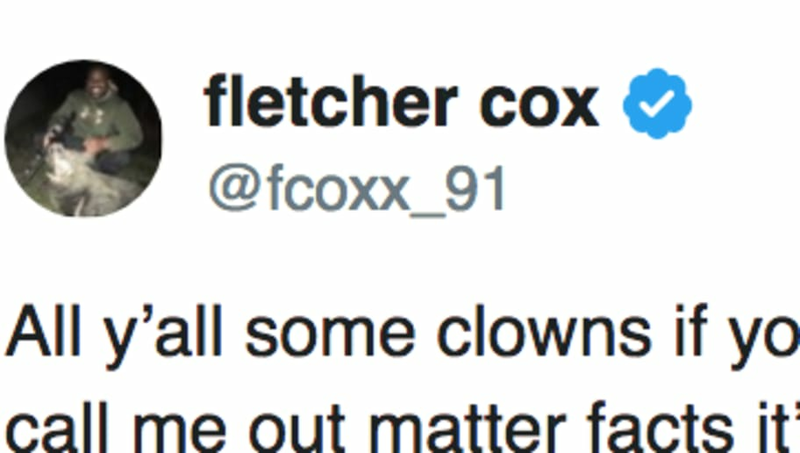 ​Fletcher Cox is not a happy camper. With the Saints down 14-0 at home against the red hot ​Philadelphia Eagles in the ​NFC Divisional Round, the momentum swung entirely in the Saints favor when Swiss Army knife Taysom Hill ran right up the gut on a fake punt. From then on, New Orleans was in complete control. Allegedly, they reason they ran that fake was based on film study, which showcased ​Cox would take it easy on similar plays. Yeah, that's not a great look to put on tape. ​​Cox took some major exception at criticism being thrown his way. The All-Pro defensive tackle, who left the game injured several times and played hurt late, claimed that the fake punt was the exact play he was injured on. Cox may be defiant, but the video looks pretty incriminating. A foot injury preventing him exploding off the line of scrimmage would be a legit excuse, but Cox didn't even make an attempt to get by the blocker. Either Cox has the worst first step in football (which he doesn't) or he didn't go 100 percent on the play in question.